None of us like to see our patients becoming distressed and upset. It makes us feel uncomfortable and pressured to do something to ‘fix’ the person immediately. 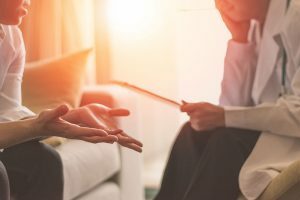 This tip sheet will give you help you manage your clients distress, feel more comfortable working with people who are upset, and increase your rapport with your patients. I outline how to prevent over-disclosure by patients, use grounding techniques to relieve distress, and improve rapport. By using these strategies, you can show patients that you care, that they’re not ‘too much’ for you, and that you can help. Re-traumatisation can lead to a deterioration in the patient’s condition. Rapport between you and your patient can be reduced. Treatment adherence and openness for suggested interventions may be reduced. For some patients, it is very important to them that they can talk about what has happened to them, particularly if they are sharing this for the first time. However, when patients over-disclose this can lead to re-traumatisation, distress, embarrassment and dropping out of treatment. It takes clinical judgement to balance acknowledging and validating patient experiences and containing their emotional distress. “What your describing about your past is very important. Thank you for sharing that with me. I can see that it has made it very distressed and I want to make sure that you get the best treatment possible. “Quite often, people who have experienced trauma want to find relief quickly. What I want to do is avoid retraumatizing you. By that, I mean stirring up a lot of emotions from the past before you have the resources to cope with them. “I can see that this is really important to you. Talking about your memories from the past may bring up more emotion than we can deal with in our short time together and I don’t want you to leave your appointment feeling worse than when you came in. Name one thing that you can taste. Ask them to place one hand on their belly and one hand on their chest. Notice the rhythm of their breath and listen to the sound of your voice. Ask them were the emotion is the strongest in their body and get them to imagine turning this sensation clockwise, and then anti clockwise. Repeat for three time or more, emptying the lungs a little more each time. Bring them back to the semantic part of their mind and out of their memories. How have you managed to survive all these painful events? What has helped you to cope up until now? How would you like your life to different in the future? What are you going to do after your appointment? By using motivation interviewing strategies such as validating their emotions (e.g. providing affirmations and encouragement) and using a summary of what they have told you, you show that you have been listening, you understand, and you care. This makes patients more open to your treatment suggestions. By offering patients a range of treatment options they are more likely to engage in the treatment because they feel that they have chosen it themselves. You might include psychology, medication, useful websites, self-help books, and exercise as possible options. You can also recommend the treatment that is likely to be the most effective. Scales can help to indicate the likelihood of a traumatic past without inquiring directly. The Posttraumatic Checklist for the DSM 5 (PCL-5) and Impact of Events Scale Revised (IES-R) have both been validated for use with clinical populations. Using scales can give you an indication of the severity of the effects of trauma, without minimal activation of those memories. To organise a rep visit to your surgery or make a referral, visit our referral guide.